Here's a fun poster I designed for the 3rd annual Summer Squeeze. 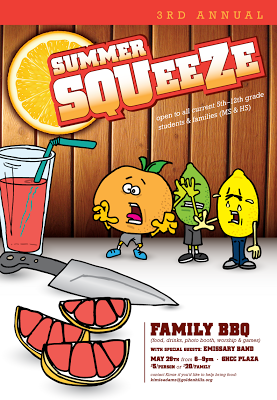 Every year I have used these fruit characters and drawn them in different humorous scenarios. It gives me a chance to go back to my first art love, cartooning. And it always gets people talking about the event, which is the goal. This family BBQ, summer hangout time for all middle school and high school families is a great time as the school year winds down. I always try to give this a light, summer feel.